Frying dough may have been a common practice for centuries in European countries, but the first donut recipe is rumored to have originated in an American cookbook. And although the crispy, sweet taste of a donut is now famous worldwide, many donuts are still high-carb, packed with sugar, and fried in questionable oil. That’s why having some low-carb, gluten-free, sugar-free keto donut recipes on hand is a must if you’re trying to lose weight or generally want to feel better. That’s where these keto chocolate donuts come in. With only 2 net carbs and 2 grams of dietary fiber, these sugar-free chocolate donuts make an excellent keto dessert that you can add to your meal plan guilt-free. One primary cause of digestive issues is inflammation. Inflammation can damage the lining of the GI (gastrointestinal) tract and affect your ability to break down and assimilate nutrients from food. Collagen protein is packed with amino acids that are known for repairing your gut lining. It works by helping to seal and heal gut inflammation so you can absorb nutrients from your food. In one study, researchers found that people suffering from irritable bowel syndrome (IBS) had low levels of serum collagen — suggesting a connection between collagen and gut inflammation[*]. Another gut-friendly ingredient in these donuts is the grass-fed butter. Grass-fed butter is an excellent source of dietary butyrate, which may help reduce inflammation in the gut — especially in your colon. It supports overall digestive function by acting as food for the cells that line your digestive tract and may reduce complications of leaky gut, IBS, and Crohn’s disease[*][*]. Eggs are a wonderful source of the carotenoids lutein and zeaxanthin. Ever wonder where egg yolks get that beautiful yellow color? Lutein and zeaxanthin can take the credit there. Research suggests that lutein consumption is associated with a decreased risk of heart disease and also impacts several markers for heart health, including inflammation and atherogenesis (the creation of arterial plaques)[*]. Eggs also contain a type of fat called phospholipids. Phospholipids in eggs have an impact on your cholesterol levels, inflammation, and may reduce your overall risk for heart disease[*]. But if you want to reap the potential heart-health benefits of eggs, make sure to buy eggs from pastured or omega-3-fed chickens. Studies show that eggs from chickens fed fish oil can have a significant impact on your serum triglyceride levels — an important marker for heart disease[*]. 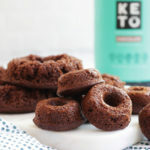 In addition to providing energy for your body, these keto chocolate donuts will also provide fuel for your mind. Cacao may have positive effects on your mood and cognitive function by stimulating blood flow to your brain and enhancing your ability to grow brain cells. After gathering and prepping your ingredients, preheat your oven to 350 degrees Fahrenheit. Grab a donut pan or mini donut pan out of your pantry and coat it evenly with non-stick spray or butter. In a large bowl, add in all dry ingredients and then mix in wet ingredients using a stand mixer, or a mixing fork and whisk until the batter is nice and smooth. Let it sit for 3-5 minutes then grab your large bowl and pour the batter into the donut pan, evenly. Place the pan in the oven and bake for 15-18 minutes or until the donuts pass the toothpick test. A toothpick test is when you insert a toothpick into a baked good, and the toothpick comes out clean. It’ll be tempting not to eat these sweet treats right out of the oven but give them a few minutes on the cooling rack before you dive into keto donut dreamland for the first time. It’ll be worth the wait. If you want to add a little extra dose of pizzazz to these donuts, you can melt some keto-friendly chocolate chips, allow it to cool slightly, then stir it into some cream cheese or coconut butter and drizzle over each donut as a chocolate glaze. Or, even better, just spread some Perfect Keto Nut Butter or peanut butter on each donut for a perfect chocolate-nut butter combination. For a dairy-free version simply replace the melted butter with coconut oil and choose unsweetened coconut milk or almond milk. Preheat oven to 350°F and coat a donut pan with non-stick spray or butter. Add all ingredients to a large bowl or stand mixer and whisk until smooth. Let sit 3-5 minutes. Divide and pour batter into the pan. Bake for 15-18 minutes until a toothpick comes out clean when poked through each donut. The Ultimate Keto Cheeseburger CasseroleWhat Are Sugar Alcohols and Are They Good For Your Keto Diet?